We're now about a month in to the new year, and for many of us, about a month into our New Year's resolutions. Did you set any goals for fitness and health this year? We both know that committing to losing weight or being healthy isn't just something you do for a few months and then revert back to your old ways. It's a commitment to a different lifestyle. Health, wellness, and an active lifestyle are very important to both of us, so we're sharing some tips on how to form healthy habits with you today! 1. Set measurable goals. Goal-setting is awesome, because it gives you something to work toward. However, if you don't set specific, measurable goals, you'll never know when you've reached your goal and you'll never have a sense of accomplishment. Weight loss goals are probably the most common, but you can really apply them to anything. Work out X times a week for X minutes each. Only eat one meal out a week. Don't have more than one glass of wine on a weeknight. The list is endless, just make sure you can measure it. Start out small and attainable, then once you've reached your first goal, set the next! You'll be surprised how quickly you can achieve your goals once you set your mind to it and put your plan into motion. 2. Keep a journal or use a fitness app. The easiest way to see what you are consuming each day, or keeping track of your water intake or exercise schedule, is to write it down. For me, writing down what I eat in a day is the best way for me to get back on track and stay there. There are a ton of apps out there, or if you prefer, get a pretty journal and write it down! My preferred method is using the MyFitnessPal app. 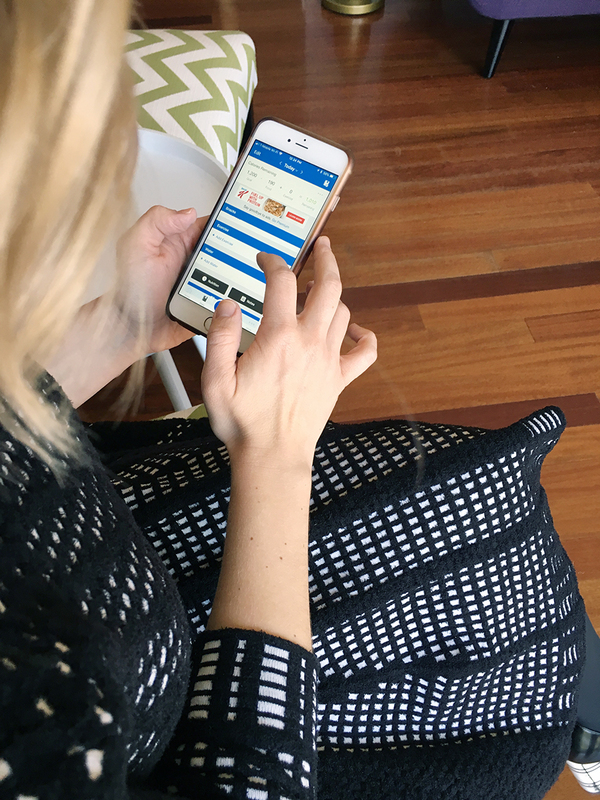 It's super easy to do and you can track calories, macros, exercise, water, and more! It also allows you to follow friends and makes sure you stay in a healthy range so you are losing weight, or maintaining it, safely. 3. Make time for exercise. This is maybe the hardest part of changing your lifestyle. Many of us feel overwhelmed with work, family, friends, kids, pets, school, errands...you name it. It can be extremely difficult to find time for exercise. However, if exercise is important to you, and it should be, you will find time to do it. Jodi: For me, I prefer to work out first thing in the morning. It's not always the easiest thing to do, but I feel so much better and ready for my day if I work up a sweat first thing. Molly: Where I work out is on my way home from work, so I don't even have the chance to get home and talk myself out of it at the end of the day. It also helps that there is a cancellation fee if you wait too close to the class time, and I've found that always keeps me motivated to never skip! The important thing is to schedule in your workouts throughout the week and then stick to your schedule. 4. Plan meals ahead of time. This is a huge one. If you have healthy, homemade meals planned throughout the week—including breakfast and lunch, and (for me) always making those the night before!—you won't be tempted to grab a quick dinner or go out for lunch because you've got beautiful produce waiting for you! 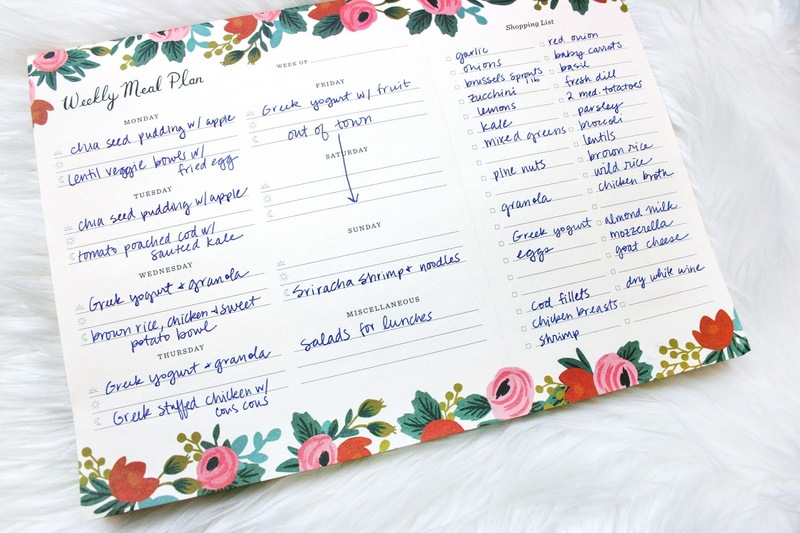 Get this adorable weekly meal planner from Rifle Paper Co. to make you meal planning even better. I love the detachable grocery list aspect! If you are going out for a meal, scan the menu online ahead of time and decide what you're going to get. Splurging is totally cool every once in a while, but if I know ahead of time I'm planning to get grilled chicken, it's much easier to not opt for the loaded mac and cheese when I get to the restaurant. 5. Up your water intake. Besides increasing your energy, promoting weight loss, flushing out toxins, and improving your complexion, being fully hydrated also improves your brain function! If you're thirsty, you're already dehydrated, so always stay ahead of the game by loading up on about 8 glasses a day. To find out exactly how much you should be drinking, try a hydration calculator like this one. 6. Get an accountability buddy. Sometimes you need a little added motivation from a friend to help you get your rear in gear, and vice versa! I know I am more likely to stick to something and turn up to a workout class if I know that someone is there waiting for me or counting on me. Plus, everything is more fun when you do it with your friends! 7. Get a move on! Take the stairs if you can (I do this daily! ), park in the back of the parking lot when you shop (obviously with exceptions for negative temps or shopping late at night alone), and take a walk over your lunch break, even if it's just around the office talking to people. 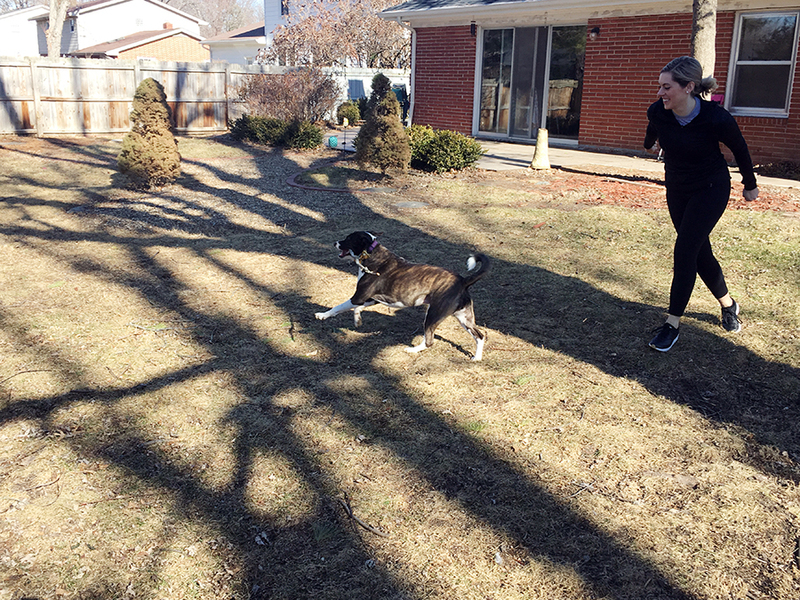 Play outside with your dog, and don't just make her do all the work (healthy pups are happy pups too!). Walk somewhere if you can. I usually don't realize how little we walk at home until I come from visiting a larger city where we walk everywhere. We've been making a point more and more to park our car on a daily outing and walk a half mile or so until our next destination rather than driving to the next parking spot. Bonus: it really helps you appreciate your city more! 8. Set time to focus on mental/spiritual health too. Typically "health" refers to physical health, but mental health is so important and can affect your overall health in major ways! Whether it's finding a little time to meditate each day or week, reading self-improvement books, or unwinding and letting your mind rest while you paint your nails or soak your feet, find a way to breathe and reset yourself free of distractions or devices. One thing that puts me at ease is making to-do lists if I feel overwhelmed, since it gives me a step-by-step of what I need to accomplish and I can feel less stressed without all these seemingly random things I have to get to floating around in my head. 9. If you fall off the wagon, don’t give up! This the most important tip on this list. It's so easy to get discouraged and just give up if you go overboard one weekend, or skip the gym a couple days in a row. Everyone needs to indulge or have a rest every now and then, and that's okay! Don't beat yourself up over it and don't get down on yourself. Every day is a fresh start. Pick yourself up and get back on track.